Size - 11/0 Package - 10g (gross weight 10,5g) Specification - japanese seed beads, color - Metallic Blue Iris (452) Country of origin – Japan.. Size - 4x7mm Package - 10g (gross weight 10,5g) Specification - japanese seed beads Magatama, color - Matte Copper Iris (2005) Country of origin – Japan.. Size - 5mm Package - 5g (gross weight 5,5g) Specification - japanese seed beads Tila, color - Matte Copper Iris (2005) Country of origin – Japan.. Size - 2,5x5mm Package - 10g (gross weight 10,5g) Specification - czech superduo, color - copper metallic matte Country of origin – Czech Republic.. Size - 11/0 Package - 10g (gross weight 10,5g) Specification - japanese seed beads, color - Higher-Metallic-Frosted Copper Twilight (514F) Country of origin – Japan.. Size - 11/0 Package - 10g (gross weight 10,5g) Specification - japanese seed beads, color - Matte-Color Dark Copper (702) Country of origin – Japan.. 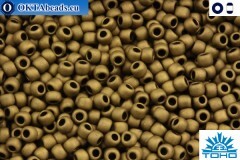 Size - 11/0 1,6mm Package - 5g (gross weight 5,5g) Specification - seedbeads Delica, color - Matte Metallic Copper (DB312) Country of origin – Japan.. Size - 6mm Package - 20pc (gross weight 7,9g) Specification - Cabochon Beads iris metallic matte (K0164) 6mm, 20pc, color - iris metallic matte Country of origin – Czech Republic..